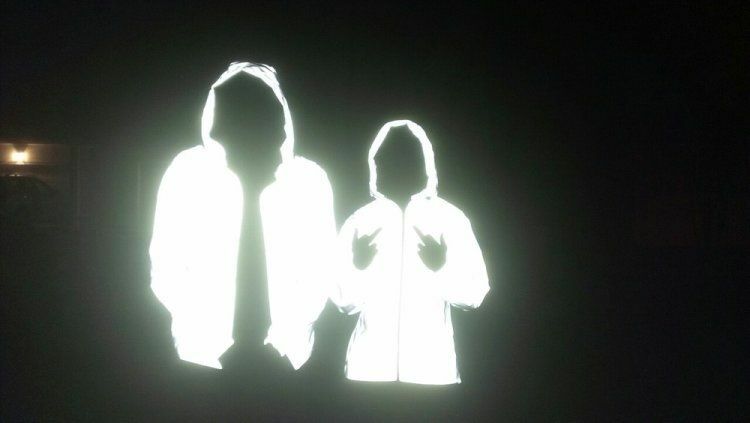 Why aren't we wearing hi-vis EVERYTHING? On saturday I woke up with the germ of an idea. What started out as a little thought soon snowballed into an outright obsession and I had to act IMMEDIATELY to get my idea put into action. This happens a LOT. The Redhead (my husband) is very used to me announcing that I need to go into town RIGHT NOW to buy, I dunno, neon spray paint, fimo, clay, resin, jewellery findings, old oil paintings of cats and earlier this week, it was a vhs tape that I intend to make into a bag. Anyway, I digress. On saturday morning I woke up wondering why reflective fabric, the kind that's used for hi-vis clothing, wasn't used for ALL clothes. Just imagine! We could all look so cool and futuristic! I fully intend to correct this and make it a reality. I do have a hi-vis jacket for running and the seed of the idea started growing when The Redhead took a pic of me wearing it. The thought kind of stalled until this saturday when I suddenly had to put my plan into action. 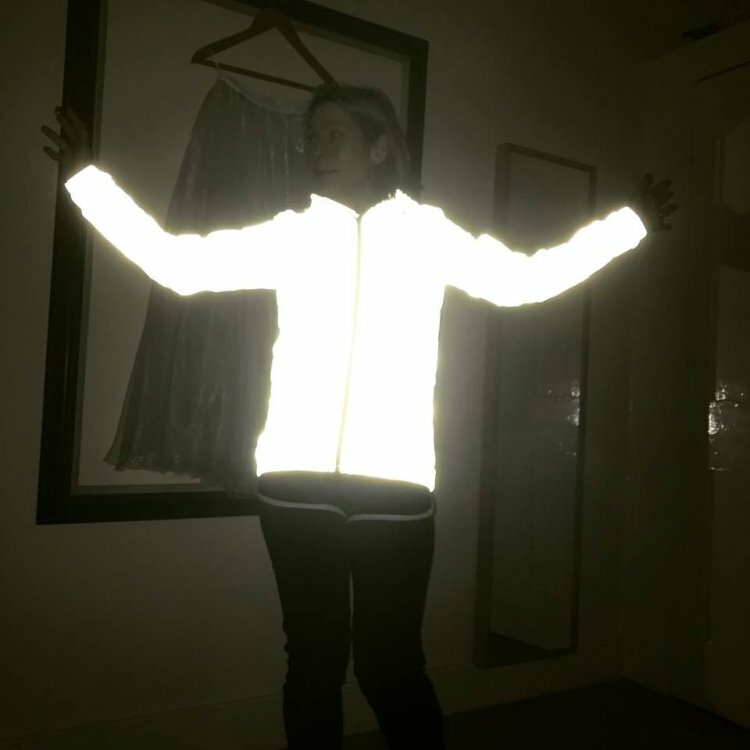 I first looked online to find where I could buy reflective clothing and mostly found things like this. Er, no thanks. I did find this, which is supercool, but it's not every day I have run-ins with the paps so maybe not. What I really wanted was a dress or a skirt made entirely of reflective fabric so it would look fairly utilitarian UNTIL a light hits it and then... well... wow. Good old eBay. I don't know what I'd do without it. I found this ace material and contacted a brilliant dressmaker, (Emma, she's fab) and she said yep, shouldn't be a problem. I am going to get a full circle skirt made with a very deep waistband and with pockets (I LOVE pockets in a dress to the point where I think every dress should come with pockets. Maybe I was a kangaroo in a previous life? ), see pic below for inspo. As you can see the skirt will look fairly 'ordinary', a nice (bleugh! Nice!) grey skirt, until I'm walking home or am papped (er...), then the whole skirt will light up like a a thousand suns. 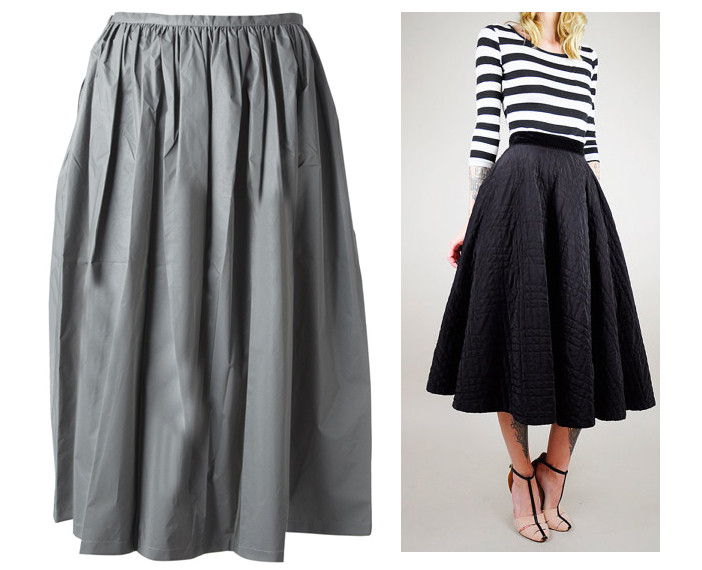 I've included a pic of the black skirt as I like the shape more than the one on the left. I can't wait! I'm going to order the fabric in the next couple of days and wing it off to Emma and shall report back ASAP. I've ordered the fabric so operation glo-skirt is happening. Can't wait to see the finished result. Here's an artist's impression to keep me going.